Fiber optics refers to the technology of transmitting light down thin strands of highly transparent material, usually glass but sometimes plastic. Fiber optics is used in communications, lighting, medicine, optical inspections and to make sensors. The FOA is primarily interested in communications fiber optics, so this book will focus on that application. Here is a short history of modern telecommunications. Fiber Optics in communications works by sending light signals down hair thin strands of glass fiber (and sometimes plastic fiber.) It began about 40 years ago in the R&D labs (Corning, Bell Labs, ITT UK, etc.) and was first installed commercially in Dorset, England by STC and Chicago, IL, USA in 1976 by AT&T. By the early 1980s, fiber telecommunications networks connected the major cities on each coast. By the mid-80s, fiber was replacing all the telco copper, microwave and satellite links. In the 90s, transoceanic fiber optic cables replaced satellites between most continents. Now fiber has become cost effective for direct connection to the home. 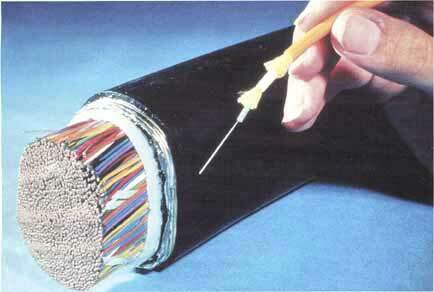 CATV discovered fiber in the mid-1990s and used it first to enhance the reliability of their networks, a big problem. Along the way, they discovered they could offer phone and Internet service on that same fiber and greatly enlarged their markets. As cell phones became better, more convenient, powerful and less expensive, they created a gigantic communications market. The advent of the smart phone caused almost a 100 time growth in cellular traffic in less than a decade. Cellular network backbones were built on fiber. As cellular wireless communications has grown, coverage requirements has expanded to require the use of fiber optics to directly connect antennas on cell towers to tower base electronics, distributed antenna systems (DAS) in large public facilities and small cells in urban areas. Computer networks (LANs) started using fiber about the same time as the telcos. Industrial links were among the first applications as the noise immunity of fiber and its distance capability make it ideal for the factory floor. Connecting graphics displays and mainframe storage links, the predecessors of today's fiber SANs (storage area networks) in data centers came next. Today fiber is used in most corporate LANs as backbones, connections to desktops for engineering or graphic workstations and many wireless access points. Other applications developed too: cell phone network antenna connections, aircraft, ship and automobile data busses, CCTV for security, even links for consumer digital stereo! Big users of fiber optics today are municipalities who use it for connecting schools, departments, smart traffic lights and CCTV surveillance systems. Some even offer direct fiber connections to their citizens or businesses. Today fiber optics is either the dominant medium or a logical choice for every communication system. Costs have been reduced so much that fiber to the home is now cost effective, especially since it can offer services (entertainment as well as communications) that no other medium offers. Whenever you read an article or talk to someone about fiber optics, you need to know the point of view. We're mainly concerned with communications fiber optics, but it's also used in medical or nondestructive testing inspection and lighting. Fiber optics, you see, is not all the same. Even in communications, we have "outside plant" fiber optics as used in telephone networks, CATV, metropolitan networks, utilities, etc. or "premises" fiber optics as found in buildings and campuses.Just like "wire" which can mean lots of different things - power, security, HVAC, CCTV, LAN or telephone - fiber optics is not all the same. And this can be a big source of confusion to the novice. Lets define our terms. Telephone companies, CATV and the Internet all use lots of fiber optics, virtually all of which is singlemode fiber and most of which is outside buildings. It hangs from poles, is buried underground, pulled through conduit or is even submerged underwater. Most of it goes relatively long distances, from a few hundred feet to hundreds of miles. Outside plant cables often have very high fiber counts, up to 288 fibers or more. Cable designs are optimized for the application: cables in conduit for pulling tension and resisting moisture, buried cables for resisting moisture and rodent damage, aerial for continuous tension and extreme weather and undersea for resisting moisture penetration. Installation requires special equipment like pullers or plows, and even trailers to carry giant spools of cable. Long distances mean cables are spliced together, since cables are not manufactured in lengths longer than about 4-5 km (2.5-3 miles), and most splices are by fusion splicing. Connectors (generally SC or LC styles) on factory made pigtails or SOCs (splice -on connectors) are spliced onto the end of the cable. After installation, every fiber and every splice is tested with an OTDR. The installer usually has a temperature controlled van or trailer for splicing and/or a bucket truck. Investments in fusion splicers, OTDRs and other equipment can be quite expensive. Most outside plant telephone installs are done by the telco themselves, while a small number of large, specialized installers do CATV, utility and municipal work. By contrast, premises cabling- cabling installed in a building or campus - involves shorter lengths, rarely longer than a few hundred feet, typically with fewer fibers per cable. The fiber is mostly multimode, except for the enlightened user who installs hybrid cable with both multimode and singlemode fibers for future high bandwidth applications. Splicing is practically unknown in premises applications. Cables between buildings can be bought with double jackets, PE for outside plant protection over PVC for building applications requiring flame retardant cable jackets, so cables can be run continuously between buildings. Today's connectors often have lower loss than splices, and patch panels give more flexibility for moves, adds and changes. Most connectors are SC or ST style with LCs becoming more popular on high speed networks. Termination is by installing connectors directly on the ends of the fibers, primarily using adhesive/polish, SOCs (splice-on connectors) or prepolished/splice techniques. Testing is done by a source and meter, but every installer should have a visual fault locator or tracer to check fiber continuity and connection. Unlike the outside plant technician, the premises cable installer (who is often also installing the power cable and Cat 5/6 for LANs too!) probably has an small investment in tools and test equipment. There are thousands of cabling installers who do fiber optic work. They've found out it isn't "rocket science," and their small initial investment in training, tools and test equipment is rapidly paid back. Few installers do both outside plant and premises cabling. The companies that do are usually very large and often have separate divisions doing each with different personnel. Most contractors do nothing but premises cabling. The biggest advantage of optical fiber is the fact it is the most cost effective means of transporting information. Fiber can transport more information longer distances in less time than any other communications medium, as the photo on the left from the late 1970s illustrates so well. The bandwidth and distance capability of fiber means that fewer cables are needed, fewer repeaters, less power and less maintenance. In addition, fiber is unaffected by the interference of electromagnetic radiation which makes it possible to transmit information and data with less noise and less error. Fiber is lighter than copper wires which makes it popular for aircraft and automotive applications. Wireless was used as a long distance medium until fiber became available, but wireless is limited by available transmission frequencies so it was dropped as a long distance medium. While local wireless has grown exponentially, it uses fiber as a backbone and connection to the international phone system. These advantages makes the use of optical fiber the most logical choice in data transmission. Thirty years ago, fiber was just being introduced. It was expensive and required PhD's from Bell Labs to install it while copper wire was easy to install. Today most communications installers do fiber and wireless as well as copper. Because fiber is so powerful, at today's network speeds fiber still has plenty of headroom and users can look to the future of ten to one hundred gigabit speeds with confidence. Telcos use DSL over copper today but it's very limited in bandwidth over typical subscriber connection lengths and many older copper wires will not support DSL speeds, leading to the adoption of fiber to the home. Copper gigabit Ethernet can work over short cables in LANs or but only if it is carefully installed and tested. But isn't fiber more expensive? Telcos and CATV operators use fiber because it's actually much cheaper. They optimize the architecture of their network to take advantage of fiber's speed and distance advantages. In LANs, you need to follow the EIA/TIA 568 standard for "centralized fiber" to optimize the fiber usage, and then it can be cheaper than copper. Installing the proper fiber today in a LAN will give you good chance of being able to handle new network speeds for years to come. One fiber, FDDI grade 62.5/125, outlasted 9 generations of copper! See Networks for more information on how to use fiber. The Secret To Success In Fiber Optics Is Training! You wouldn't try to drive a truck or fly a plane without taking lessons. Likewise for improving your golf or tennis game. Well, the secret to fiber optics is training too. With some basic knowledge and hands-on practice gained in a training course, fiber is pretty easy to install. That's what the FOA is all about. We have hundreds of FOA-approved schools offering FOA certifications. About 46,000 students have been certified by FOA schools (12/2014.) Around the world, FOA is recognized as the leader in fiber optic education and certification. The adoption of any technology depends on having workable standards to insure product compatibility. Most of what we call standards are voluntary standards created by industry groups. Standards are not "codes" or actual laws that you must follow to be in compliance with local ordinances but sensible guidelines to ensure proper operation of communications systems. Standards are often developed by groups within each country, like EIA/TIA or IEEE in the US, but are increasingly becoming international under the auspices of ISO and IEC. Standards like EIA/TIA 568 ( from the Electronic Industries Alliance/ Telecommunications Industry Association in the US) which covers all of the things you need to know to install a standard premises cabling network are good guidelines for designs and should be followed to ensure interoperability. 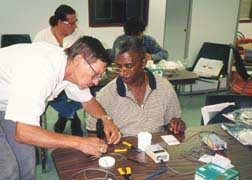 Primary measurement standards like for optical power measurements are set by standards organizations in each country like NIST (the US National Institute of Standards and Technology) and coordinated worldwide. The only common "mandatory standard" in the US - we call them codes - is the NEC 770 (National Electrical Code). The NEC specifies fire prevention standards for fiber optic cables. Other countries have similar codes for building safety. If an indoor cable doesn't have a NEC rating - don't install it - it won't pass inspection! A listing of the EIA/TIA standards is on the website of The Fiber Optic Association. Information on the EIA/TIA standards can be found on the website of most of the suppliers of structured cabling hardware. Before we get started - Safety First! You might think that eye damage from working with lasers would be the big concern in fiber optic installations. The reality is that high power lasers burning holes in metal or burning off warts mostly have little relevance to your typical fiber optic installation. Optical sources used in fiber optics are generally of much lower power levels (The exception is high power DWDM or CATV systems). Of course, you should always be careful with your eyes, especially when using a fiber optic microscope which can concentrate all the light from the fiber into your eye. NEVER look into a fiber unless you know no light is present - use a power meter to check it - and anyway, the light is in the infrared and you can't see anything anyway! The real safety lecture will always be about small scraps of glass cleaved off the ends of the fibers being terminated or spliced. These scraps are very dangerous! The cleaved ends are extremely sharp and can easily penetrate your skin. If they get into your eyes, they are very hard to flush out. Don't even think about what happens if you eat one. Always wear safety glasses whenever working with fiber and always carefully dispose of all fiber scraps! Always follow these safety rules when working with fiber. 1. Always wear safety glasses to protect your eyes from fiber scraps. 2. Dispose of all scraps properly. Always use a properly marked container to dispose of later and work on a black pad which makes the slivers of glass easier to spot. 3. Do not drop them on the floor where they will stick in carpets or shoes and be carried elsewhere. 4. Do not eat or drink anywhere near the work area. Fiber optic splicing and termination use various chemical adhesives and cleaners as part of the processes. Follow the instructions for use (detailed on the chemical's MSDS - material safety data sheet) carefully. Remember, even simple isopropyl alcohol, used as a cleaner, is flammable. Read more about fiber optic safety. View the FOA YouTube Video on Safety. Download a safety poster. With fiber optics, our tolerance to dirt is near zero. Airborne particles are about the size of the core of SM fiber- they absorb lots of light and may scratch connectors if not removed! Dirt on connectors is the biggest cause of scratches on polished connectors and high loss measurements! 2. Always keep dust caps on connectors, bulkhead splices, patch panels or anything else that is going to have a connection made with it. 3. Use special fiber optic cleaners or lint free pads and isopropyl alcohol to clean the connectors. 4. Ferrules on the connectors/cables used for testing will get dirty by scraping off the material of the alignment sleeve in the splice bushing - creating an attenuator. You can see the front edge of the connector ferrule getting black! Use the metal or ceramic alignment sleeve bulkheads only for testing. Read more about cleaning fiber optic components. Test Your Comprehension - plus a special quiz on safety!